Jumping can be an incredibly pesky problem to have, however, it’s fairly easily stopped. There are several things that go into stopping ANY problem, but especially jumping, all of the following can be learned with a trainer like HeyLudwig. HeyLudwig is an online personal dog trainer that personalizes curriculums to your dog. Some well-timed corrections, redirection into a positive, and channeling that energy into obedience is how we stop jumping and teach your dog polite greetings! 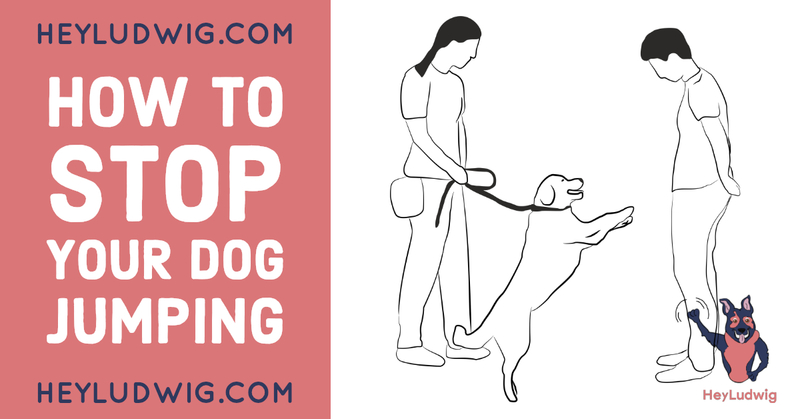 Here are the 6 things you need in order to stop your dog from jumping. Timing is one of the most important factors in any type of training. If the timing of your correction or your reward is off, training won’t be effective. For jumping, you need to correct your dog right as they start to jump. If they make contact, your timing was off. Your tone is another critical factor for quality training. Tone refers to how you speak to your dog. For example, if you’re correcting your tone should be firm but non-emotional. If you’re rewarding, your tone should be excited! Some level of correction is necessary to stop any unwanted behaviors. This can start with a simple “no” and escalate from there. Corrections aren’t mean, it’s just a way of teaching your dog that a decision they made doesn’t align with what you want. Also known as “paying” your dog, rewards are important to teach your dog what you want. There are many types of rewards and each is effective for different types of dogs. Finding the perfect reward for your dog is one of the things that HeyLudwig helps you with. Understanding triggers is really important to stopping jumping. A trigger is what causes a reaction in your dog, both good and bad. For instance, a ball triggers excitement. Alternatively, a new person may trigger jumping. Once you know what triggers your dog, you can work through that trigger. Your body language is how you communicate to your dog. Likewise, the body language of the person your dog is jumping may be communicating the wrong thing. For instance, a person with a lot of energy loving on your pup could trigger jumping. It’s important that if you have a jumper you’re trying to train that you communicate with your friends and family to not entice the jumping. Of course, this is at a very high level how you solve jumping. The details and technique require a bit more work. Luckily, there are resources out there like HeyLudwig that gives you personalized content made using the best practices of behavioral dog training to give you the most effective training paths. If you believe you’re nailing all of the points above and still struggle, it may be best to consult a professional trainer that can help you find a solution! Jumping, while frustrating, is typically not a hard problem to solve. It just takes a little structure, foundation, and patience! Want to stop your dog from jumping? Use HeyLudwig! PreviousHow is HeyLudwig so inexpensive for so much quality?